PC-MOS/386 v5.01 released under GPL v3.0! I’ve only just received notification of this, and had to post it forward. All I know is that you’ll need Borland C++ 3.1 along with Borland Brief to re-build the system. I haven’t tried it just yet, but I most certainly will! 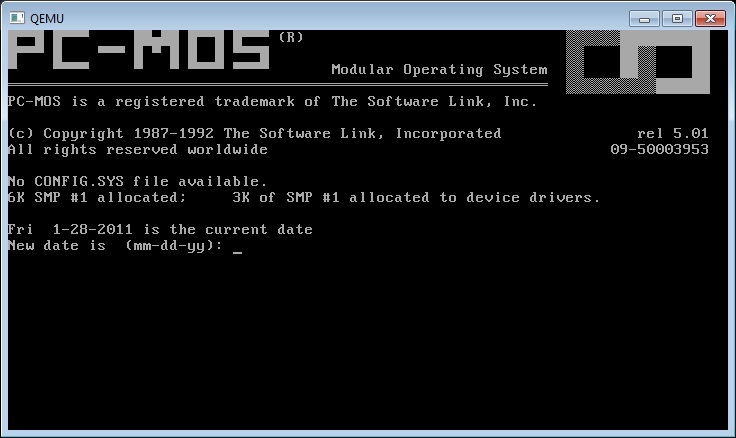 For those unaware, PC-MOS is a multi-user multi-tasking MS-DOS like Operating System. I looked at this some years ago.. More so interested in seeing if and how various MS-DOS like OS’s could run under modern emulation. It may be interesting to pit FreeDOS vs PC-MOS/386. Author neozeedPosted on September 3, 2017 Categories 80386, PC-MOS/3867 Comments on PC-MOS/386 v5.01 released under GPL v3.0! 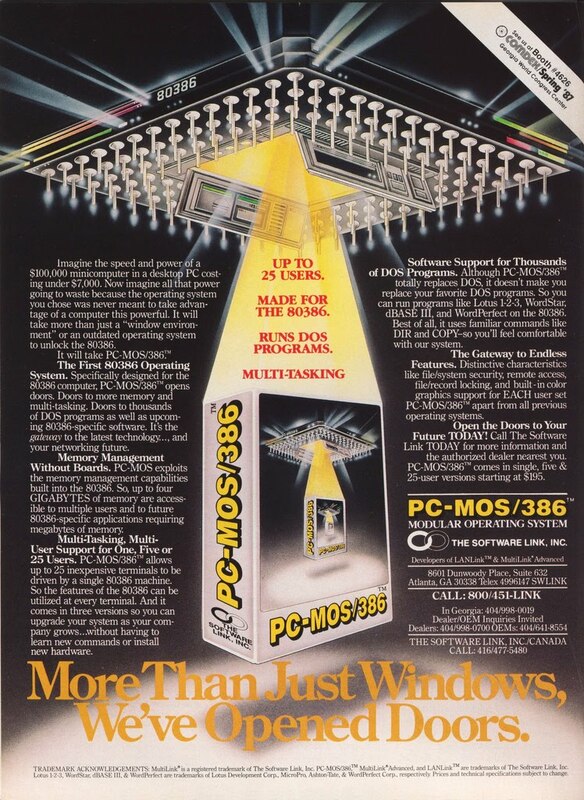 PC-MOS/386 was another multi-user MS-DOS Operating system. And they had some great ads, like above. I was able to track down a few disks but of them all only the version 5 one seemed to run to some degree under Qemu. Or at least the $386.sys memory driver. While PC-MOS/386 3.0 loads, if you try to load the protected mode $386.sys driver it just hangs. 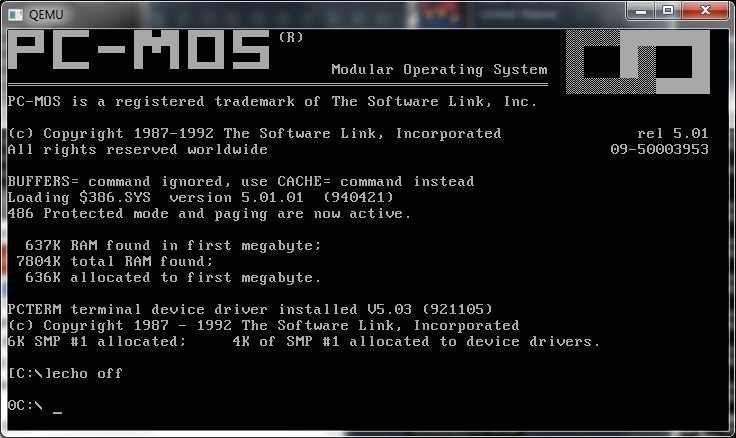 And PC-MOS/386 5.0 not only loads, but will load up with the protected mode driver on Qemu. I’ve managed to get a serial ‘terminal’ to run, and for anyone who ever needs the hint, here is the config.sys, autoexec.bat and user01.bat file to make it boot up…. Neither VirtualPC, nor VMWare can boot up with the drivers. So what is it like? Under emulation lots of keystrokes are lost, and it feels slow. I’m sure it’s a COMPLETELY different story on actual hardware. PC-MOS 5.0 also cannot run DPMI programs, which is a shame. Then again DPMI was a ‘new and exciting’ thing in 1992 so I guess it’s not that surprising. I’m not aware of any support to run Windows 3.1 but again 1992 was when the tide really started to turn to Windows. As they mention on wiki memory costs, and slow disks of the time certainly made things like PC-MOS really slow.